When I view the contacts list on my Samsung Galaxy phone, I just touched several buttons by mistake. Then some vital phone numbers were deleted all of a sudden. Unluckily, I have no backup. My Samsung device has been rooted before. Can you help me recover lost contacts from rooted Samsung phone? Thanks a lot. Many users have complained that plenty of data recovery programs on the market are not available for helping restore deleted contacts on rooted Samsung mobile phone. Take it easy. 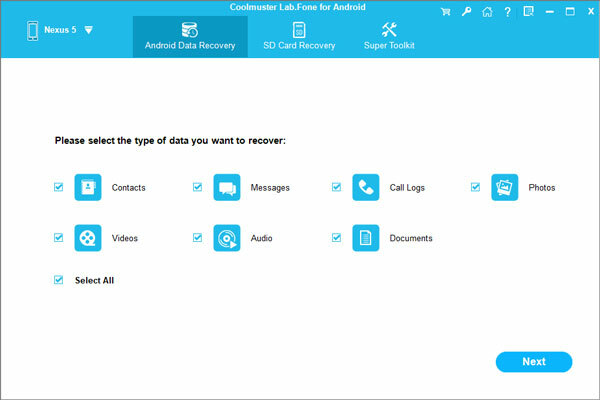 In this page, I'd love to introduce you Coolmuster Samsung Contacts Recovery, which is designed to help users recover lost contacts from rooted Samsung smart phone under different circumstances. As we all know that various factors will cause data loss from a mobile phone. Now with this program, you can easily retrieve rooted Samsung contacts after making improper settings, flashing the ROM, or resetting the phone back to factory default settings, and so on. 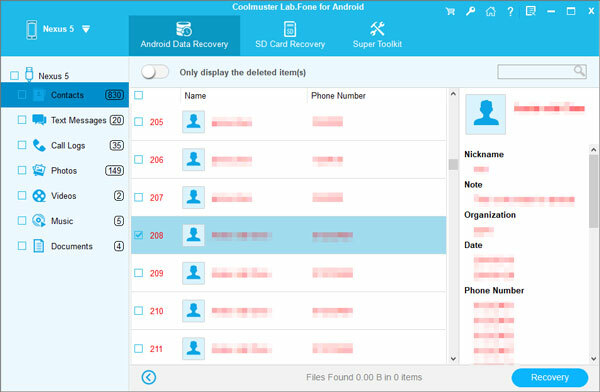 Apart from this, Samsung Contacts Recovery program also allows you to preview lost contacts before restoration. So that you can freely mark your deleted phone numbers to regain. By the way, this software will display the existing contacts on your phone as well. If you worry about losing them from your phone by accident, you'd better save them to your computer as a backup. And this program enables you to save all marked contacts to the PC in a batch. That's quite convenient. Now you can get the free trial version to have a try by yourself. By the way, you can follow the steps below to recover lost contacts from rooted Samsung device as you need. At first, install and open this Samsung Contacts Recovery program on your computer as the direction. Then link your Samsung smart phone to the computer via a USB cable. Now you can follow the steps to enable USB debugging on your phone, so as to get your device detected by this software smoothly. After that, please touch "Refresh" icon on the main menu. Then your mobile phone will be identified soon. After detecting your phone, this program will scan it thoroughly. Soon you can get all lost contacts arranged on the menu. Just view them and mark your needed ones before recovery. At last, hit the "Recover" icon, you will save all deleted contacts to your computer in a batch. As you can see, other lost files can be scanned and displayed on the menu at the same time. Now you are able to freely select part or the whole of lost data to recovered to your computer as needed.